Welcome to Forgotten Cars, a new feature I'm trying out where we highlight fascinating cars and engines that are obscure, unrecognized and lost to the passage of time. The rotary engine must think pretty highly of itself. When people discuss alternative engines, it almost inevitably comes up at some point. And you can't really even talk about Mazda's history without mentioning the rotary. But while we can all agree that the rotary is great, it's not the only unusual engine to sign up for a tour of duty in a Mazda. 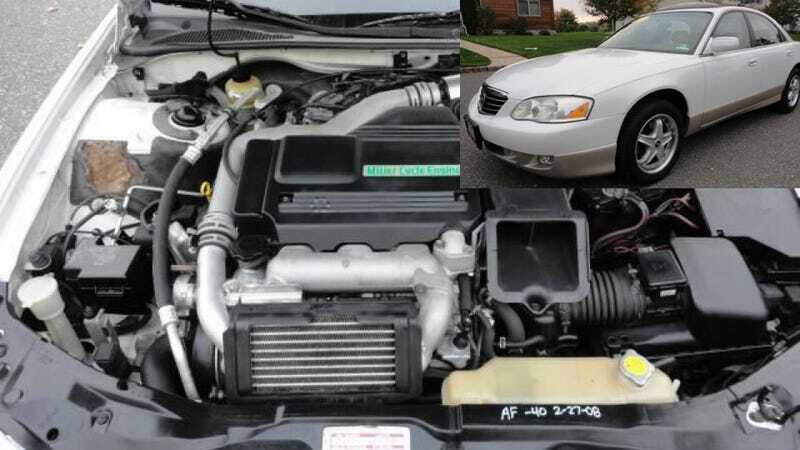 There was also the company's Miller Cycle V6 engine from the Mazda Millenia, but nobody remembers that. What's that? You didn't realize that some versions of the boring, front-wheel-drive Millenia had something truly special under the hood? Nobody's going to blame you. As far as sedans go, the Millenia is about as bland-looking as you can possibly get. Typically offered in inoffensive colors like beige, white and silver, the Millenia — sold in America from 1995 to 2003 — has absolutely no styling cues whatsoever to indicate that it is anything other than a sleepy appliance-mobile. If I were to rob a bank, I would want a beige Millenia as my getaway car, because it is indistinguishable from scores of other sedans from that era. But underneath that anonymous exterior is a tale that's quite interesting. See, the Millenia wasn't just the replacement for the rear-wheel-drive flagship 929, it was meant to be one of the first models for the luxury brand "Amati" that Mazda attempted to pull off in the early 1990s. This attempt to compete with Lexus and Acura was met with failure thanks to a worldwide recession at the time, and other factors. In spite of this, the Millenia itself — known as the Xedos 9 and Eunos 800 in other markets — had some pretty special features, including an excellent chassis and a Japan-only four-wheel-steering system that made it a potent handler. But what was truly special was what was under the hood of the Millenia S — Mazda's KJ-ZEM 2.3-liter supercharged Miller Cycle V6 putting out 210 horsepower. The result is 15 percent increased efficiency, according to HowStuffWorks. It certainly had an interesting sound, too. Mazda engineers doubtless got plenty of overtime in developing the Miller. What the driver gets is a stomping 91 hp/L and all the midrange torque one would expect from at least a largish V-6 - yet the Miller-cycle engine is just 2.3L, a displacement more common for 4-cyl. engines... We only wish that Mazda, or ever-more-involved corporate parent Ford, would find more ways to use this innovative and refined engine. The Millenia is a wonderful car, but we can't help thinking that new Cougar could be a lot of fun with the Miller-cycle underhood. That, unfortunately, was not to be. The Millenia was killed off in 2003 and it was not replaced, and that clever Miller cycle V6 never saw duty in any other car. So why didn't the Miller cycle V6 see more action? Motive Mag once brought up some good reasons: it's complex, expensive, and doesn't really add that much power to the car. It's an interesting setup, but it's not all that worth it. Mazda did put a Miller cycle engine to use again in the current Mazda2, which uses a 1.3-liter Miller Cycle engine in non-U.S. markets, but this one is naturally aspirated. What do you think? Would you like to see the Miller cycle put to use on more cars? Do you have any experiences with the Millenia? Help me out, Jalops. I'd like to make Forgotten Cars a regular thing, but I need suggestions. I'm looking for stuff that's really obscure and that even the most seasoned car experts know little about. Give us some ideas in the comments!